LF: Who Dat? Back In The Closet With Cory Booker! Title: Who Dat? Back In The Closet With Cory Booker! After we left Pitchers and Catchers in the East Village, we went to a party somewhere. 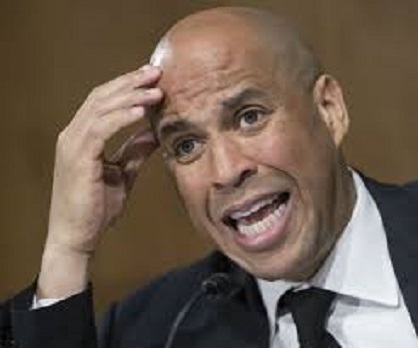 Cory Bookers real Spartacus Moment? Cory and I were alone in a bedroom and were playing spin the bottle after Cory drank all the MD 20/20 so we had a bottle to play with. Then he started smoking crack cocaine. He asked me if I wanted a back rub, and what I thought of Cher  you know the usual white gay stuff, which I found somewhat odd for a black man. Anyway, he put on a B-52s CD and dimmed the lights. Things were happening very fast. I remember he told me if he ever ran for senate hed have to hurt me very badly if I told anyone what he was about to do to me. He put his hand over my mouth when I tried to scream for help. I was scared. I thought he might inadvertently kill me. He must have put something in my Mojito, because when I came to several years later, I was in a cab on my way back to Brooklyn. My shirt was stained. I was having trouble concentrating. It hurt to walk. Even though it was decades ago and I had suppressed the memory, last Friday  while I was eating a little sesame seed cake at Starbucks  it all came back to me! I suddenly remembered that there were three other men in the room, one of whom had a strange name like Barracks or Bangkok or something. And a man named Deval. I cant be sure. I am certain, though, that an old Jewish lady had a nice Chinese man put me in a cab, who asked me in broken English what I was doing next Friday night and if I liked to dance the Macarena. After all these years, I finally came forward when I discovered Cory was really a Senator! This man cannot serve in the Senate! Hes a predatory closeted gay man who doesnt even know who the Pet Shop Boys Are. Or care! And I think hes paying large black men to follow me into gay clubs, dance with me, buy me drinks, and then take me home with them. Im now in hiding in a bungalow in Key West because I fear for my life. Senator Booker is a gay monster! And Honey, believe me cuz Im tellin the truth  he is just SO unfit to serve in the United States Senate!